Kitchen cabinet drawers are really an easy way to arrange your kitchenware as they slide in and out effortlessly. However, if you are making them yourself, or installing a new front on an existing drawer, you need to be meticulous with the measurements or it may affect the movement. Let us first begin with what all you may need to create kitchen cabinet drawer fronts on your own. Kitchen cabinet drawer hardware would include the following: Cabinet drawer slides, cabinet knobs, cabinet handles or pulls and cabinet bolts. Depending on the slides you want, you could select from undermount slides, ball bearing slides, roller bearing slides, file drawer slides, pencil drawer slides etc. For example, if you have a large drawer for stacking dishes etc., then you should go for file drawer slides. It is easy to select the right slides for your drawer with little guidance from your local hardware shop. Knobs can be fancy or simple bar pulls depending on your kitchen styling. Drilling machine, table saw, chop saw, radial arm saw, orbital sander, router, clamps, nuts and bolts etc. are the necessary hardware items you need for such work, so keep them handy. 1. The size of drawer front needs to be measured. Once you have the exact measurements, cut the wood length using radial arm saw and width using table saw. 2. Once you have routed each edge with a router, use a sander to smoothen imperfect finish. 4. Paint it according to your style. 5. Now fix the drawer front to your four-sided box drawer. You will have to drill pilot holes from the inside of the drawers keeping the backside of the new front stuck. Be careful not to drill right up to outside. Attach the drawer fronts now using wood screws. 6. To attach the drawer pull, drill holes in the center of the drawer front through to the inside of the drawer. Firmly attach the drawer pull to the center of the drawer front. 1. Pull open the drawers. Check the screws that hold up the front to the drawer. 2. Firmly loosen and remove the screws taking care not to damage the inside of the drawer. 3. Gently and slowly pull the front off the drawer when the screws are loose enough. 4. Measure the new drawer front against the old one to match the dimensions. Now place the new drawer front and firmly screw it onto the drawer. 1. Pull out the existing drawers from their position. The new drawers should be measured against the old ones to get the dimensions right. 2. Once sure, fix the slides on the outside and check if they easily move against the existing tracks. 3. If the drawer does not fit in properly, remove the tracks and reposition them to get the right slip of the slides on the drawers. In case you do not have time or skill to make new drawers or front, replacement kitchen cabinet drawers are available to easily replace your old drawers and avoid the hassle of dismantling any existing kitchen units. Check with your local hardware shop or just browse online. Once your drawers are in place, you may want to quickly dump in the stuff that has been lying around the kitchen for long. But think before you do so, for it will only add to clutter. 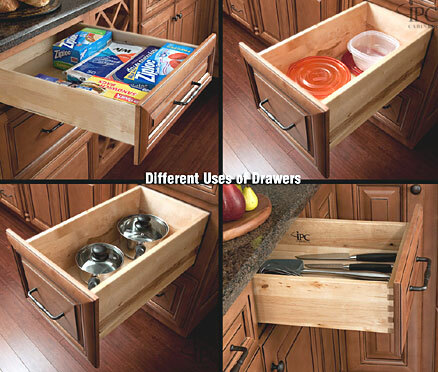 So, get your drawers organized first with kitchen cabinet drawer organizers. There are drawer dividers, cubes, knife sleeves, drop-in drawer pegs and flatware organizers available to keep your kitchen stuff placed neatly. Flatware organizers are great for your silverware and other cutlery. You can choose to have few or many compartments. Knife sleeves are great for safety and may be modular to accommodate more than one knife. Utensil dividers and plate holders are excellent way of keeping the utensils neatly stacked in one drawer. I am a big follower of your kitchen blog, Ganka. A handful of your articles have truly helped me out. Thanks! How do you determine the different sizes of pulls to install for your kitchen cabinets? Thanks for your quick reply. My question was that I have different size cabinets and drawers. I’m using both knobs and pulls. All of my knobs will be the same size on the top cabinets, but different size pulls on the drawers. Is there a rule of thumb about what size pulls to use on different size drawers, how many different sizes would you use? In my opinion, you have to use one and the same size pulls on all drawers regardless their size. Just select a type of pull that won’t look too big on the smallest drawer and too small on the biggest drawer. Also ensure that the styles of the knobs and pulls match.